Original Editors - David Grinnell from Bellarmine University's Pathophysiology of Complex Patient Problems project. Rocky Mountain Spotted Fever (RMSF) is a tick borne disease, due to an intracellular pathogen known as Rickettsia rickettsi. 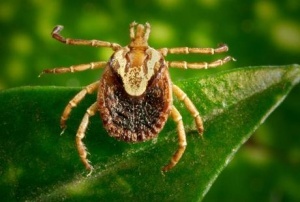 This pathogen is carried by ticks and is transmitted to humans via a bite from an infected tick; thus it is considered and infectious disease as well as a zoonotic disease. Three known ticks in the United States carry this pathogen: the American dog tick (Dermacentor variabilis), Rocky Mountain wood tick (Dermacentor andersoni) and the brown dog tick (Rhipicephalus sanguineous). The American dog tick carries the pathogen in the western United States, and the wood tick carries the pathogen in the eastern United States. This infection was first described in the Rocky Mountains in Idaho in 1896. Howard Ricketts found the causative agent in the early 1900’s. This systemic infectious disease is treatable, however, if left untreated it can be fatal. 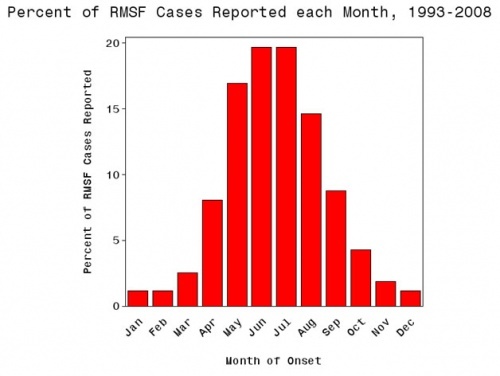 Between 1993 and 1996, there were 1253 reported cases of Rocky Mountain Spotted Fever (RMSF). This amount of confirmed incidence is roughly 2.2 cases per million. Since that time period there has been some increase in confirmed cases. In 2008, the number of cases jumped to approximately 8 per million. However, the number of fatalities has decreased and currently is about 0.5%. There is some distinction between race in the diagnosis of RMSF. Caucasians are two times more likely to be diagnosed that those of African American decent. Compared to the general population, American Indians are at the greatest risk for contracting the disease. For data that was collected between the years of 2001 and 2005, the American Indian incidence rate was calculated at 16.8 per million, while caucasians were at 4.2 per million, African Americans at 2.6 per million, and Asian/Pacific Islanders at 0.5 cases per million people. Other cases of RMSF have been confirmed in Canada, Mexico, Central America, Columbia, as well as Brazil. Currently, there haven’t been any confirmed cases of RMSF beyond the boarders of the American continents. The R. ricketttsi pathogen can have numerous systemic manifestations affecting the: cardiac, pulmonary, gastrointestinal, renal, neurological, ocular, musculoskeletal, and integumentary systems. If infected the individual may face moderate to severe illness. The initial symptoms usually will begin 2-14 days after being bitten by an infected tick. Doxycycline is the standard medication prescribed when physicians are suspicious of RMSF. Adults are prescribed to take 200mg by mouth or IV two times per day. Children who weigh less than 100lbs are to take 2mg/lb by mouth and those children who weigh above 100lbs are suggested to take the same dosage as an adult, 200mg by mouth or IV, two times per day. There has been some previous cause for concern that older medications such as tetracyclines may cause staining of a child's permanent adult teeth, however, recent treatment with doxycycline has not been shown to cause staining. Medical treatment should be continued for a minimum of 3 days after one's fever had decreased. Typically, medical treatment of this disease will last anywhere from 7-14 days in length. If an allergy to doxycycline exists or a if a women is pregnant, other medications are available as treatment. Chlorampenicol is another antibiotic that may be prescribed, however, this medication has some adverse side effects such as: aplastic anemia and grey baby syndrome. Recommended dosing for Chloramphenicol is 500mg via IV divided 2 times per day for 7 days. General antibiotics have not been found to be effective against RMSF and sulfa drugs may actually worsen the infection. Tetracyclines have been found to increase hypthrombiemic effects of anticoagulants, and they have also been found to decrease the effectiveness of common oral contraceptives. Overall, the initial diagnosis of RMSF is made based on the clinical signs and symptoms. Data that is gathered later via specific laboratory tests will confirm the working diagnosis of RMSF. Thus it is extremely important to begin a course of antibiotic therapy if RMSF is suspected as soon as possible. The gold standard for the diagnosis of RMSF is the indirect immunofluorescence assay (IFA) with the R. ricettsii antigen. This method has a high sensitivity and specificity rated at 94%. This is performed by obtaining two serum samples and then comparing the IgG and IgM antibody titers. Ideally, the first serum test should be completed as early as possible when symptoms first set in, and the second sample be tested 2-4 weeks after the initial test. A four fold increase in these antibody titers confirms the diagnosis of RMSF. RMSF is a possibly fatal tick-borne illness. Three known ticks in the United States carry the pathogen R. rickettsii:the American dog tick (Dermacentor variabilis), Rocky Mountain wood tick (Dermacentor andersoni) and the brown dog tick (Rhipicephalus sanguineous). The American dog tick primarily carries the pathogen in the United States, primarily in the western United States. The Rocky Mountain wood tick primarily carries the pathogen in the eastern United States and the brown dog tick is thought to be the vector for the pathogen in Mexico. In addition, there are other tick species that are thought to carry the pathogen. In Central and South America, the Cayenne tick is thought to be the vector for the pathogen. R. rickettsiiis transmitted to humans via a bite of an infected tick. The tick bites do not cause pain, and many don't know they were exposed to the ticks. The transmission process can be completed in as little as 4 hours extending up to 24 hours. Most cases of RMSF occur between the months of April and September and usually occur in rural settings, however, they are not confined to just the rural community. If an attached tick is found, it is important to remove it as quickly as possible. Health professionals recommend that protective gloves be worn during this process . It is best to remove the tick via tweezers as close to the skin as possible and carefully pull it out. Take precaution to not squeeze or twist the tweezers upon removal. As soon as possible, disinfect the wound area as well as your hands. It is not advised to burn ticks out or the topical application of petroleum jelly . 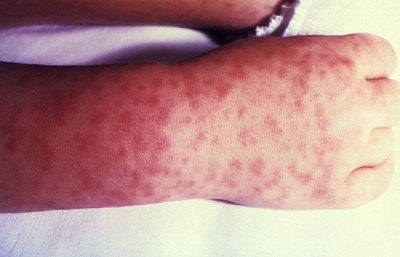 Rocky Mountain Spotted Fever is a systemic disease in nature. Infected individuals can presented with numerous signs and symptoms that will have an affect on the: integumentary, cardiac, pulmonary, gastrointestinal, renal, neurological, ocular, and musculoskeletal systems. The Rickettsia pathogen reproduces intracellularly after being introduced through the skin via a tick bite. The pathogen is then spread by the bloodstream and the body's lymphatic system. Please see above section entitled "Medication". Rocky Mountain spotted fever is an infectious disease that a physical therapist can not diagnosis and treat. It is important for a physical therapist to recognize the signs and symptoms that are not congruent with a disorder of the musculoskeletal system so they can be referred to a physician for further examination. One important piece of subjective information a physical therapist needs to gather during the initial evaluation is if the individual has recently been out in the woods or other outdoor areas where ticks can thrive, or if they own pets that spend time outdoors as well as indoors. Pets can commonly bring the vectors of RMSF into the home. Bergeron JW, Braddon RL, Kaelin DL. Persisting impairment following Rocky Mountain Spotted Fever: a case report. Arch Phys Med Rehabilitation 1997; 78: 1277-80. ↑ 1.0 1.1 1.2 1.3 1.4 1.5 1.6 1.7 1.8 Lacz NL, Schwartz RA, Kapila R. Rocky Mountain spotted fever. JEADV 2006, 20, 411-417.